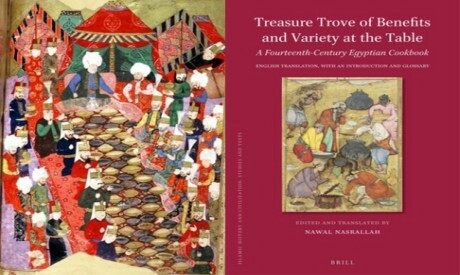 For culinary enthusiasts as well as for those fascinated by Egypt’s heritage, the very first English-language translation of a mediaeval Egyptian cookbook entitled Treasure Trove of Benefits and Variety at the Table.A Fourteenth Century Egyptian Cookbook will come as a thrilling revelation. The original Arabic manuscript of this cookbook of 832 recipes is entitled Kanz Al-Fawaaid Tanwei Al-Mawaaid, and it was penned by an anonymous author during Egypt’s Mameluke era. With its versatile and comprehensive array of recipes, it contains the full range of the Egyptian culinary heritage as it stood at the time. Many of the dishes mentioned remain part of Egypt’s modern kitchen, such as an ibrahimiya meat dish in which mastic is used. The book remained unknown to the general public until the Arabic manuscript was edited and published in 1993 by Manuela Marín and David Waines. In November 2017, the English language translation was issued by Brill, its title being a literal rendering of the Arabic. The translation, accompanied by an extensive introduction, was undertaken by Iraqi scholar Nawal Nasrallah, who is also a food blogger and an avid cook. Nasrallah taught English at the universities of Mosul and Baghdad in Iraq before moving to the United States in 1990. She was often asked by her American friends about Iraqi recipes, and the lack of resources on the topic in the US led her to write on and research Arabic culinary culture. “Kanz Al-Fawaaid was written at a time when Egypt was an important centre in the Arab- Islamic world,” Nasrallah told Al-Ahram Weekly. However, before then the Kanz Al-Fawaaid presents the modern reader with a culinary itinerary that is arresting in its versatility and comprehensiveness. It includes meat and vegetable dishes, sweets and savouries, and fermented foods and drinks. Detailed instructions are given on how to make distilled drinks, compotes, sauces, incense, perfumed oils, medicinal and herb preparations, and hand-washing compounds. Most notably, the book includes the oldest known recipe for hummus, offering 11 variations on the dish. It also includes the oldest known existing recipe for okra, a staple of the Egyptian kitchen. Nasrallah also gives her take on recipes that she has personally tried from the book. “The subya (a traditional Egyptian beverage) was quite refreshing, the laymun malih (salt-cured lemons) appetising and reasonably salty, the hummus kassa, or mashed cooked chickpeas with tahini, was a revelation to me, as I found in it the prototype of today’s hummus,” she says. It certainly holds fascinating insights for all lovers of cooking and culinary culture. These include guidelines for the use of materials in cooking utensils, favouring soapstone (biram) and earthenware (fakhar) and only when required pots of tinned copper. Such recommendations may resonate with our modern-day awareness regarding the benefits of cooking in earth-derived utensils. Her translation presents us with a veritable treasure trove of delights, and it is an intellectual no less than a culinary achievement that is impressive in its scope as well as its depth. Put all the ingredients, except the salted lemon, in a food processor, and pulse the mix until it looks smooth. It should look green. Add more of the herbs if needed. The consistency of the mix should be thick enough to pick up with a piece of bread. Add a bit more lemon juice if needed. Fold in the chopped salted lemon. To serve as a dish, spread the condiment on a plate, drizzle a generous amount of olive oil over it, garnish it with chopped parsley, and give it a light sprinkle of cinnamon and crushed rose petals if you like. Combine the ingredients and smear the pieces of fish with them. Put the fish in a colander set above a bowl and set it aside for about an hour. When ready to fry, dust the fish pieces with flour and fry them in the hot oil. Brown them on both sides and keep them in a colander to get rid of any extra fat. Fry the onion in one tablespoon of oil until nicely browned. In a small bowl, combine the spices and salt. In another bowl, whip together the tahini, vinegar, water, and saffron or turmeric. Add the contents of both bowls to the fried onion and bring the mixture to a boil while stirring. Place the fried fish pieces on a platter and pour the prepared tahini sauce over them and serve.